This Sign Supply is a Sign Making Kit for Use at Every Business! Where to Buy Wholesale Sign Supplies! We provide these sign supplies, sign making kits, with one (1) 3' x 5' nylon flag, one (1) 60" long aluminum pole and one (1) affixing mount. These sign supplies, sale flags, are simple to put together with their brass grommets and aluminum snaps. Merely fasten a hook to every grommet and set up the mount onto a wall. 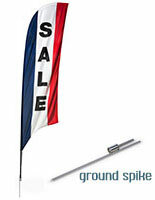 The sale flags, sign supplies, include a 1/4" diameter washer to reinforce a flag's attachment to the pole. 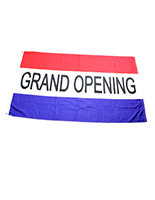 These 3' x 5' banners, sale flags feature an adjusting wall mount that allows the angle of the displayed flag to be altered. In truth, the wall mount can be adjusted from 0° to 90° almost immediately! 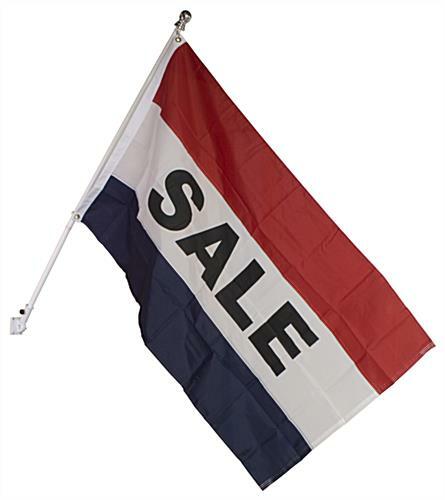 Sale flags, communication flags, and other sign supplies are an inexpensive means to attract more visitors into your sales! These ready to ship sign supplies for sale wholesale are the perfect choice for businesses that have multiple sales in one year! 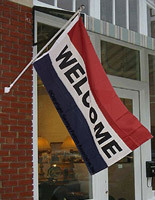 Sale flags, sign supplies, work to attract more visitors into every business. 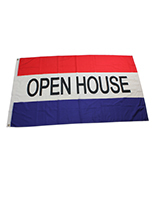 These communication flags, sale flags are made with a common red, white and blue design ensuring that everyone notices your sign. These sign supplies are printed with the word "sale" that is written black that sits against the white background. These sign supplies, sale flags, are constructed from 100% nylon for a long-lasting exhibit that can be utilized over and over again! Wholesale sign supplies online!